The New Jersey daughter of a pilot says she has the guitar, but a lawyer for Dylan claims the singer still has the Fender Stratocaster that he used during one of the most memorable performances of his career. Musician Bob Dylan, pictured here performing onstage during the 17th Annual Critics' Choice Movie Awards, was a hero to folk music fans in the early 1960s. Bob Dylan and historians at PBS are in a dispute over the whereabouts of an electric guitar that the singer plugged in at the Newport Folk Festival in 1965, quite possibly the most historic single instrument in rock 'n' roll. The New Jersey daughter of a pilot who flew Dylan to appearances in the 1960s says she has the guitar, which has spent much of the past 47 years in a family attic. But a lawyer for Dylan claims the singer still has the Fender Stratocaster with the sunburst design that he used during one of the most memorable performances of his career. If the authentic "Dylan goes electric" guitar ever went on the open marketplace, experts say it could fetch as much as a half million dollars. The guitar is the centerpiece of next Tuesday's season premiere of PBS' "History Detectives," and the show said late Wednesday it stood by its conclusion that Dawn Peterson, the pilot's daughter who works as a customer relations manager for an energy company, has the right instrument. On July 25, 1965, that guitar was more an object of derision than desire. With his acoustic songs of social protest, a young Bob Dylan was a hero to folk music fans in the early 1960s and the Newport festival was their Mecca. Bringing an electric guitar and band with him onstage to launch into "Maggie's Farm" was more than an artistic change, it was a provocative act. Most folk purists disdained rock 'n' roll. What happened next is a little foggy. Did an enraged Pete Seeger really try to cut Dylan's electric power? Was the crowd upset about the noise, or by Dylan leaving the stage after only three songs? Was it even upset at all? He later returned for a couple of acoustic songs. Either way, Dylan never looked back. Music has its share of memorable instruments, like Paul McCartney's Hofner bass or the Gibson guitars that B.B. King calls Lucille. Yet it's tough to think of any instrument that was the focus of an event more meaningful than the electric guitar Dylan played that day, said Howard Kramer, curatorial director of the Rock and Roll Hall of Fame + Museum. "This is not just kinda cool. This is way cool," said guitar expert Andy Babiuk. "We all love Bob Dylan, but this is really a pinnacle point not just in his career but for music in general. I don't think music in the 1960s would have been the same if Dylan had not gone electric." Victor Quinto briefly flew music stars like Dylan, The Band and Peter, Paul & Mary around during the 1960s. Peterson, his daughter, said Dylan left the Fender behind on an airplane and Quinto took it home. She was told that her father contacted Dylan's representatives to get them to pick it up, but no one ever did. Quinto died at age 41, when his daughter was 8, and she treasures any remaining connection to her dad. The guitar was in her parents' attic until about 10 years ago when she took it. Peterson had no idea about its history until a friend of her husband's saw it and mentioned the possible Newport connection. After unsuccessfully trying to verify it on her own, she turned to "History Detectives" about a year ago for help. "When I heard it, I was like, 'Yeah, right,'" said Elyse Luray, a former Christie's auction house appraiser and auctioneer who co-hosts the PBS show. But there were intriguing clues. Peterson's father left behind an address book that included a phone number for "Bob Dylan, Woodstock." Luray showed the guitar case to a former Dylan roadie who recognized the name of a little-known company that Dylan had formed at the time stenciled on its side. A sheaf of papers with handwritten song lyrics was in the guitar case and PBS took them to an expert, Jeff Gold, who said the handwriting matched Dylan's. The fragmentary lyrics later appeared, in part, on songs that Dylan recorded but rejected for his 1966 "Blonde on Blonde" album. Luray took the guitar to Babiuk, an appraiser of instruments who consults for the rock hall. He took the guitar apart to find a date written inside (1964) that made its use in Newport plausible. He drew upon blown-up color photos from Newport to compare the wood grain on the guitar Dylan played that day to the one in his hands. He's confident it's a match, likening the wood grain to a fingerprint. 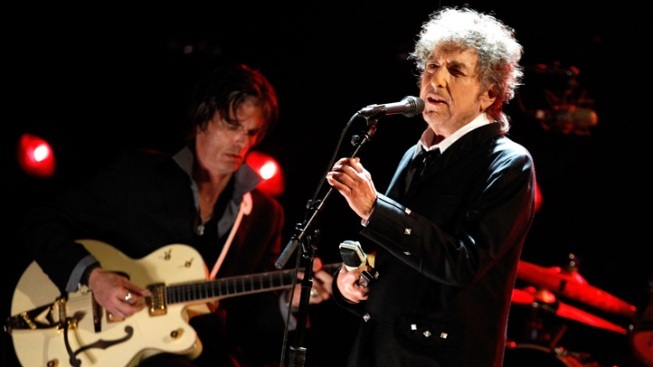 Dylan's lawyer, Orin Snyder, said late Wednesday that the singer had the guitar. "He did own several other Stratocaster guitars that were stolen from him around that time, as were some handwritten lyrics," Snyder said. "In addition, Bob recalls driving to the Newport Folk Festival, along with two of his friends, not flying." In a response, "History Detectives" spokesman Eddie Ward said the show continues to believe Peterson has the guitar in question and would "welcome the opportunity" to examine the guitar that Dylan says is the one he played that day. Peterson said she stood by the "History Detectives" conclusion. Babiuk said he didn't want to get involved in a dispute, but said he was "99.9 percent certain" that he examined the guitar used at Newport. Peterson said she had written to Dylan's lawyers in 2005 requesting that Dylan waive any claim to the guitar. Lawyers declined the request and said it should be returned but until this week, there had been no further contact. Unlike some musicians who prize instrument collections, Dylan has generally looked upon them as tools to convey his art, much like a carpenter's hammer, Kramer said. "I don't think he's dwelled on a guitar he hasn't played for 47 years," he said. "If he cared about it, he would have done something about it." That doesn't mean lawyers or managers wouldn't be aware of its value and fight for it, however. Peterson told The Associated Press in an email that she had no plans to sell or donate the guitar to anyone. "The guitar remains in a safe place," she wrote, "away from my home."